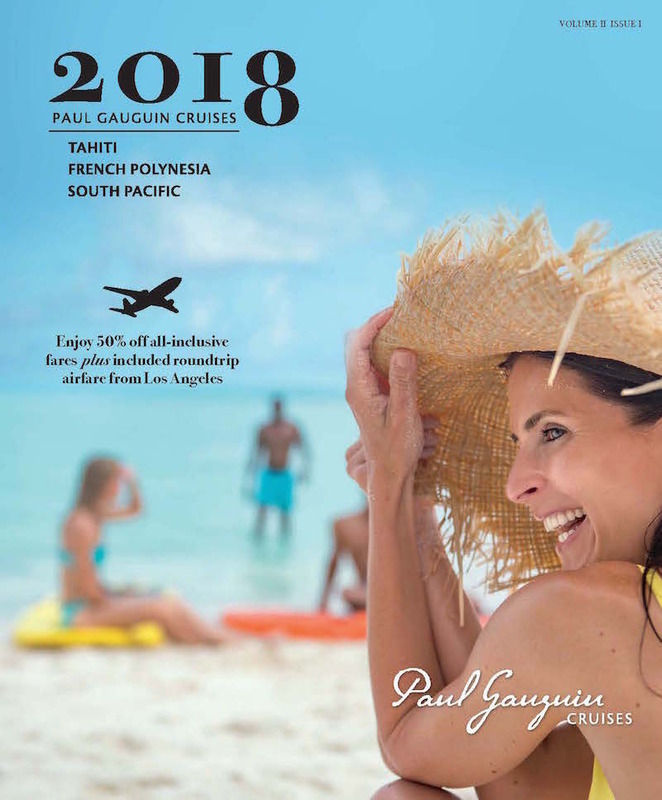 Paul Gauguin Cruises has launched its 2018 Voyages brochure featuring Tahiti, French Polynesia and South Pacific itineraries. The brochure features sailings on comany’s The Gauguin vessel. In 2018, Paul Gauguin Cruises will be the first cruise line to visit the port city of Vairao in Tahiti Iti, which is the smaller of two landmasses that comprise the island of Tahiti and offers a wild coastline, ancient petroglyphs, marae (temples), Polynesian culture and surfing fame. Tahiti Iti is scheduled on seven-night Society Islands & Tahiti Iti voyages and a special sailing of the ten-night Society Islands & Tuamotus itinerary. The Gauguin will also be showcasing its most sought-after itineraries in 2018: the seven-night Tahiti & the Society Islands, ten-night Society Islands & Tuamotus, 11-night Cook Islands & Society Islands and 14-night Marquesas, Tuamotus & Society Islands. Designed specifically to sail the lagoons of these islands, the ship provides an authentic experience of the South Seas. On all sailings, guests also receive complimentary access to Paul Gauguin Cruises’ two exclusive retreats. Off the coast of Taha’a lies the islet of Motu Mahana, where guests can enjoy a day of watersports, Polynesian activities, a sumptuous barbecue feast and cocktails from full and floating bars. In Bora Bora, guests can relax on a private, white-sand beach and enjoy refreshments, a game of volleyball and snorkelling and paddle boarding in crystal-clear waters. Again in 2018, Paul Gauguin Cruises’ partnership with the Wildlife Conservation Society (WCS) offers two interactive, educational programmes. During the summer months and holiday season, Stewards of Nature is offered and invites children ages seven to 17, as well as their families, to discover and value nature through hands-on interactive learning. The Wildlife Discovery Series is an onboard lecture programme focusing on the environment and wildlife presented by conservationists, scientists and oceanographers. The cruise line is including round-trip airfare from Los Angeles on all 2018 voyages. Cruise only prices start from £3,307 per person based on the seven-night Tahiti & the Society Islands voyages departing 8th and 15th December 2018.